Four fun-filled activity books to learn English. 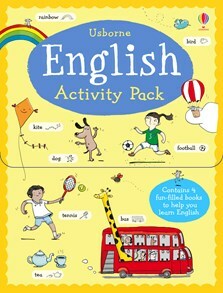 A sticker book with stickers for over 200 English words, an English words activity book and a phrases activity book to practise speaking English. There’s also a write-in picture dictionary, and you can listen to all the words read by a native English speaker at the Usborne Quicklinks website.